RPG fans could be forgiven for feeling a little hard-done by the PS3. Despite the original promises of Final Fantasy exclusivity and all that jazz, the console has struggled to meet expectations. Well, two years in and yet not a moment too soon Valkyria Chronicles steps onto the stage with what is perhaps the most compelling argument to fans of the genre to stick with Sony’s machine. The most striking thing about this title at the offset is its setting. While the game does, like all good JRPGs, have anime at the center of its beating heart, it finds itself set within a post-industrial world that roughly mirrors the image of Europe at the end of the Second World War. Watching the game’s opening sequence it is impossible not to draw almost clumsy comparisons between historical Europe and the fictional land of “Europa”. This slapdash allegory serves a purpose however, too many RPGs set in expansive fictional worlds end up bogged down in the process of explaining that world and the result the gameplay suffers. 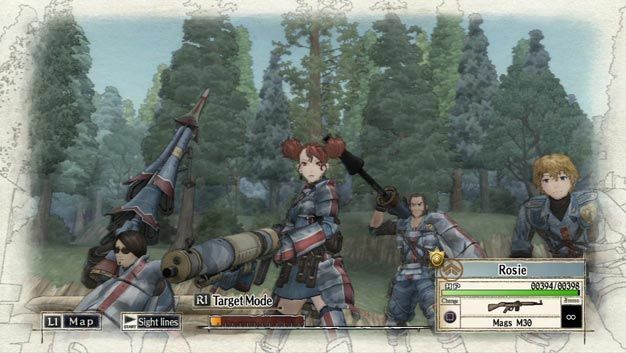 By taking a loose picture of historical Europe, Valkyria Chronicles lets players fill in the historical context themselves while the game focuses on character and gameplay development. In terms of the plot: an evil empire (literally called “The Empire” as though that wasn’t a big enough cliché) has taken it upon itself to expand its dominion from a fictional representation of the USSR into a collection of loosely united democracies which we would know as the rest of Europe. The story follows Lieutenant Welkin Gunther and his squad as they lead the resistance against the empire and its nefarious plot. The second thing which hits like a splash of cold watercolour to the face are the visuals. Built on the CANVAS engine, at first the game cannot help but look like another Okami wannabe. However, half an hour in you’ll find yourself gawping in wonder at the stunning character movement and masterfully animated cut scenes. Gazing into the game’s pallid beauty, I found it hard to reason why I had been so dismissive of it in the first instance. This illustrative aesthetic really sobers the mood and reminds us that this isn’t some psychedelic anime-inspired fantasy but a genuinely serious attempt at telling a genuinely serious story. 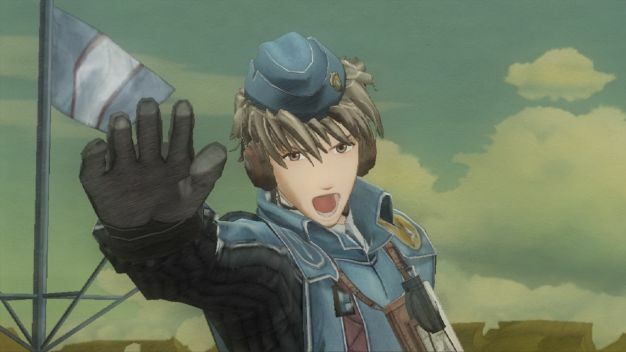 The vast majority of Valkyria Chronicles operates through a “Book Mode”. This basically acts as a visual framework out of which the player can select missions, cut scenes, settings and literally everything else they could possibly think of. This is a mixed blessing, however. There is no world for you to freely roam around in and all character interaction/development goes on within the many many long cut scenes. As such, huge swathes of time are spent listening to characters waffle on about sometimes the most trivial things. This greatly undermines some of the more dramatic and entertaining cinematic moments and furthermore means that all time spent playing is done within the very narrow framework of the game’s battle mode. Comfortingly, the battles can be long winded and engaging enough to help the player forget that after it there will be another lifetime of cut scenes and dialog before the next piece of action. At the end of the day, this is an efficient way of managing the game and it makes revisiting earlier events incredibly easy, however it completely disjoints the gameplay and story to the point where it feels less like one complete experience and more like an anime movie running alongside a strategy game. Speaking of strategy, when I finally got involved in my first battle I was surprised to find the game definitely places its emphasis on the side of strategy than that of traditional RPG gameplay. The game lands in an interesting space between turn-based and real-time strategy. While your characters have fixed movement, actions, HP and AP there is a live element of danger from other enemies as the player moves each character around the battlefield. Combined with the tension of making every footstep count, this transforms the usually dull “movement phase” into something completely different and infinitely more engaging. Aside from the main character and his ragtag group of friends, the player is put in charge of selecting, managing and maintaining a squad of 20 other fighters. Characters are split into a number of classes — including Scout, Shocktrooper, Lancer, Sniper and Engineer – each with their own strengths, weaknesses and role to play on the battlefield. Each individual character from the 30-something you have to pick from has their own name, voice and personality. While superficial, this is a lovely little touch. Surprisingly, the personality of each character really does come through in the heat of battle and makes up for a lot of what the cut scene/gameplay disparity cuts out. Before each battle you will have to select a limited number of fighters from your roster to place into the theatre of combat. Understanding the demands of the battle and paying attention to any hints dropped by NPCs before this stage are critical. In many ways, the outcome of each fight will be determined by exactly who you decide to bring into play. Making the wrong choice and seeing them slaughtered, or having to sub them out mid-battle is a big waste of precious turns. Using the experience gained from battle, you can choose to level up and outfit your character classes as you see fit. Again, keeping on top of this and thinking strategically is critical. It is in this levelling up functionality that the game harks back to its RPG roots. And, like all RPGs, putting the time in to level up your characters will pay dividends later. The gameplay is sufficiently deep and the sheer numbers of potential approaches to a given situation mean it has huuuge replay value. Despite being so deep it is important to remember that this game is always played within a visually stunning environment, making even the most drudging and long-winded battles a sheer delight to play through. Valkyria Chronicles features a story that, while relying heavily on 20th century history in its premise, manages to spiral off on its own tangent into what very quickly becomes a wonderfully rounded epic and definitely the best reason I’ve seen yet for RPG fans to maintain faith in the PlayStation 3. Strategic elements of the game very unforgiving and often vague.